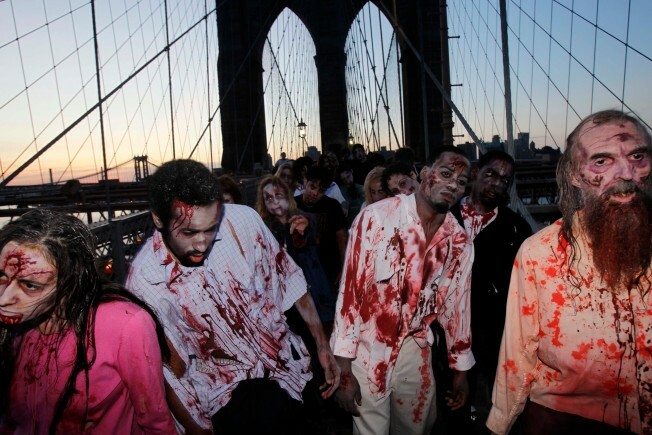 Costumed actors, promoting the Halloween premiere of the AMC television series "The Walking Dead", shamble along the Brooklyn Bridge while posing for pictures in New York, Tuesday, Oct. 26, 2010. Classic zombies — like the ones in George Romero’s 1968 film “The Night of the Living Dead” — shamble. The zombies in 2002’s “28 Days Later,” they sprint. Ain’t it the truth. Zombies are — true to their mythological form — everywhere these days. AMC’s got “The Walking Dead,” created and written by Academy Award-nominee Frank Darabont, debuting at 10 p.m. on Halloween, while IFC’s British miniseries “Dead Set” premiered Oct. 25. Even Comedy Central’s “Ugly Americans,” which debuted in March, stars animated zombies. Stay calm, but the culture has been zombified. By which she means deliver a regular series in which zombies are ever present, if not exactly main characters. “Walking Dead” focuses on what happens to the world after the dead begin to rise, which leads to the downfall of civilization. The lead character, a police officer, wakes in the hospital to find himself alone except for the undead. When he escapes, it’s off to find his family and then figure out how to survive. The living humans are as much a risk as the dead ones, in many cases. “I’ve always been a fan of zombie movies, but I’m not usually a fan of how they end. I felt there was more story to be told,” said Robert Kirkman, whose long-running comic series was adapted for “Walking.” “So this way we get to look at how people crack under pressure or rise to the occasion — and the interaction of humans becomes almost as dangerous as interaction with zombies. And that may be a big reason why zombies haven’t made for riveting television on their own. Prior to this new spate of series, practically the only time zombies got the spotlight was in the 1960s ABC soap “Dark Shadows,” which was known for a monsteriffic cast that included vampires and zombies. Zombie appeal has a long history, cropping up in literature around the 19th century. Freud even made reference to “the uncanny,” something that’s both familiar (like a human) and bizarre and unfamiliar (like an undead human coming after you) simultaneously. Haitian voodoo also makes use of zombies in rituals in which radical hypnosis plays a part. But in modern times, zombies re-established a hold in the public’s braaaains with Romero’s “Living Dead,” a low-budget B picture that also alluded to the then-ongoing Vietnam War. People became fascinated as much with the concept of zombies as their metaphorical meanings, which often reflect anxieties of the time. Stephen Asma, professor of philosophy at Columbia College, Chicago, and author of “On Monsters: An Unnatural History of Our Worst Fears,” suggests that part of the current appeal may tie into the unreasonableness of monsters — and terrorists. So will the encroaching zombie assault send vampires back into their coffins? Darabont hopes so. He recently noted that zombies are “the anti-sparkle,” referring to “Twilight’s” neck-biters. Which may help beef up AMC’s male demographic in viewers, but there’s just as good a chance that women will want to tune in for the emotional resonance behind the other half of “Walking’s” end-of-the-world story, which includes women warriors and tough-as-nails mothers defending their cubs. Randee Dawn is a freelance writer based in New York, and was born with a remote control in her hand. She is the co-author of “The Law & Order: SVU Unofficial Companion” and was bitten by the zombie bug long enough to write "Can't Keep a Dead Man Down" for Well Told Tales' Podcast.